Not much writing has been happening I'm afraid, as sharing a small study with hubby is not conducive to concentrating on blog posts and creative writing. Still no sign of my published piece in Writing magazine yet, unless I missed it. The thuthpenth! Does anyone have an April 2012 issue of Writing magazine? 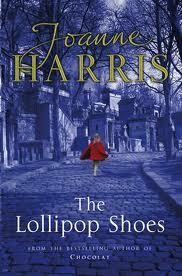 However, I read the sequel to Joanne Harris' Chocolat called The Lollipop Shoes, which I found immensely enjoyable (on the whole) though I couldn't get my head around the idea that while Chocolat seemed to be set in the late 1950's, the sequel was set in modern day with mobile phones and Internet. I would like to thank all those who took part in my Giving Voice Blogfest. I enjoyed reading the varied entries, with their imaginative and thought-provoking scenarios. Congratulations to one and all. and hope that you, my lovely supporters, remain as followers, while I'm taking a break, though I'll be visiting you all when I get a spare moment here and there. Outside the Speech & Language Therapist’s room Katy sat twisting her handkerchief around and around her thumb. This seemed worse than waiting to take her Key stage 3 SATS exams. Her mother glanced at her with hooded brows that said ‘Stop that!’ though no words were spoken. Her mother hated making a scene in public. In just a few moments Katy knew she would have to talk to the stranger they had come to see and she always had to attend these sessions with her mother, which somehow made it ten times worse and better at the same time. The door to the clinic room abruptly opened and she was bathed in a shaft of warm light that seemed to spread a calming glow over her frazzled nerves. “Would you like to come in now” Rebecca Lees smiled at them. Katy and her mother sat side by side on the padded chairs provided. “So how can I help you?” Rebecca Lees smiled. Katy could feel her eyes widen in horror and her mouth felt like a dried prune. She nodded, lowering her eyes. “C-c-c-can I?” Katy replied in a gush of enthusiasm, while cringing at the way her words sounded as if she was hurling them up like a bad meal, those same words that others found so easy to utter. Yet this therapist seemed different from all the other she had met over the years. Sign up to the linky below and post your entry TODAY 4th June 2012. You will be raising much needed awareness for those who are speech and language impaired. The more people who Blog about this Blogfest and post up their stories the better it will be. Don't forget to visit the entries and leave a comment. Thank you.